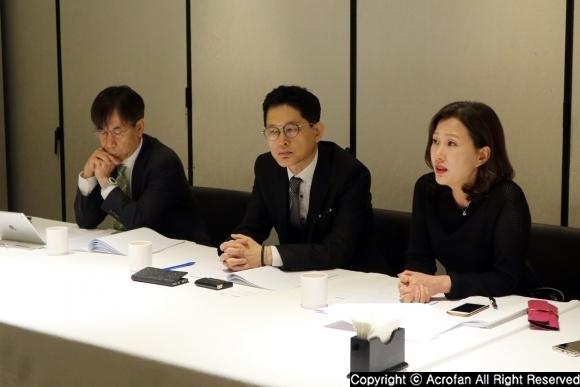 Hdac Technology, a technology company of hybrid blockchain project 'Hdac', announced its business strategy and technology development roadmap at Grand Intercontinental Seoul Parnas Hotel in Seoul, Korea, on March 13. It was announced that Hdac Technology is designed as an enterprise architecture where a hybrid blockchain project 'Hdac' can reflect the needs of diverse industries. 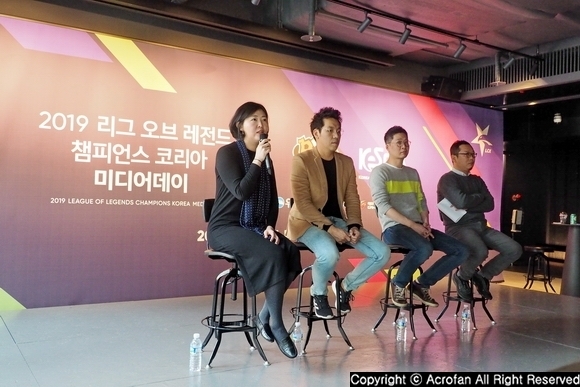 It will also revitalize DApp ecosystem with enterprise blockchain service and develop the FinTech business led by HyundaiPay. 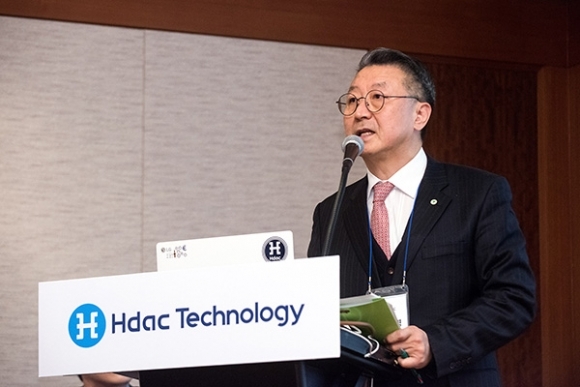 In the first quarter of 2019, Hdac Technology plans to complete the SDK(Software Development Kit) and API (Application Program Interface) development to establish an enterprise solution development environment and secure a framework. Particularly, by aiming at DevOps, the firm will support rapid and easy development, deployment, testing, and distribution of Hdac-based blockchain infrastructure. In addition, it will actively explore DApp with growth value and act as an accelerator, thereby realizing the increasing value of Hdac and building a platform that can fully cover the ecosystem. The goal is to provide a Blockchain-as-a-Service (BasS) solution that can easily and conveniently build and operate infrastructure and services based on blockchain, even if the company is not a blockchain specialist. Hdac Enterprise Blockchain Solution can be used in a variety of fields ranging from construction and real estate areas, such as smart home and P2P transactions, manufacturing areas including electronic contracts, purchases, process emergency detection, and production history management to finance and distribution areas using membership points or prepaid cards. Smart Factory enables application and implementation of various new IT technologies such as AI, IoT, cloud, and blockchain by converting data generated at the manufacturing site into big data. Currently, the firm is in the stage of executing POC with Hyundai-affiliated manufacturing-based companies and considering Smart Factory business that controls various factory facilities and machines and collects data through combination with AI and IoT technology based on blockchain. ▲ Hdac Enterprise Blockchain Solution can be applied across a wide range of industries. ▲ Wallet Service provides a two-sided (user and biz partner) integrated service as a platform for various FinTech services. FinTech business, which is headed by HyundaiPay, is based on offering a payment service that can use cryptocurrency conveniently in daily life. 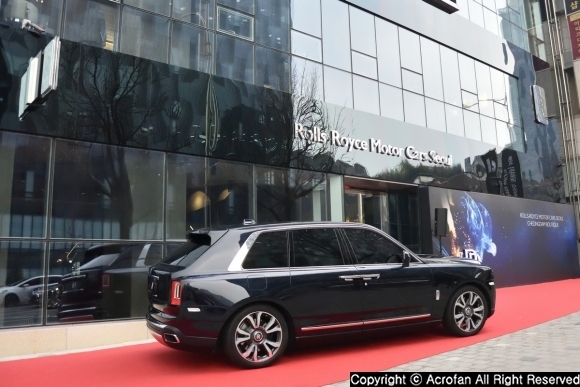 Unlike Switzerland-based Hdac Technology, HyundaiPay is operated as a domestic corporation, so Michael Yoon and Moon-Ok Cho, CEO and CTO of Hdac Technology, are also CEO and CSO and HyundaiPay at the same time, respectively. As for FinTech business based on blockchain, the firm will first expand its business centered on the killer services including Prepaid Point Payment Service and Real Estate P2P Service and secure customers at the same time. After that, it will create a user-friendly Wallet Service platform for actively targeting FinTech market. Prepaid Point Payment Service, which is the core, can be used for simple remittance, on/offline merchant payment, smart home service, and simple payment after issuing a prepaid point, “H point (tentative name)”, with Hdac Coin. The “H point” will be evolved as a stable coin in the future. The charging means includes not only Hdac Coin but also various cryptocurrencies, affiliate points, and account cash transfer. By the fourth quarter of this year, the firm plans to provide gift card purchase services such as department store gift cards and Gifticon, and QR code payment service in retail stores. Moreover, by the first quarter of next year, it plans to expand its use by providing simple payment service at mobile/online shopping malls and payment service of electricity and gas bills at the luxury apartment brand, 'HERIOT', of Hyundai BS&C. Real Estate P2P (Peer-To-Peer) Service will provide profits to investors by selecting real asset products such as real estate. It is composed of investment product guide, product evaluation, credit evaluation of business operator, education, consulting, etc. It prepares FinTech product based on real assets to guarantee stable profit rate to users. In particular, it is planned to provide a blockchain-based P2P platform that enables easy management of real assets and reinvestment into various types of assets in connection with the Prepaid Point Payment Service. In the future, it will be expanded to P2P financial services based on various assets. Furthermore, Hdac Technology will showcase Wallet Service, which will be an upgraded version of the existing Hdac Wallet as a FinTech service platform for end-users and business partners. As any complicated authentication procedure has removed, it is to provide an easy and convenient blockchain-based integration service that allows the general users who do not know the blockchain to quickly register by using only their phone numbers. Wallet Service will provide multi-chain wallet, simple remittance, simple payment, point charging function including two-sided (user and biz partner) integrated service as a platform of various FinTech service as well as user's simple and friendly user experience. It will be conducted in a form of portal service that supports Prepaid Point Payment Service and Real Estate P2P Service. 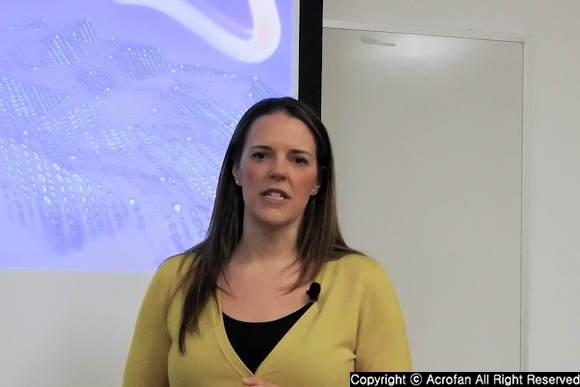 When the environment is created, personalization services will be prepared through AI or data analysis. 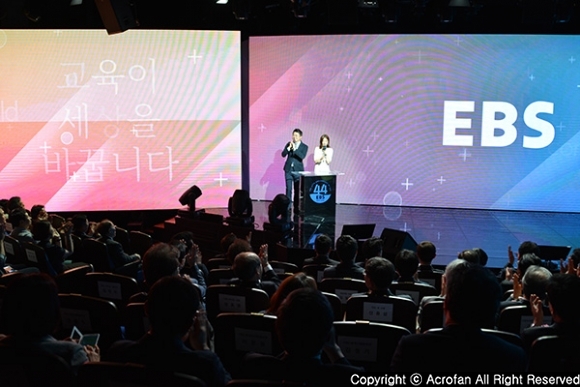 On the other hand, it was announced that Prepaid Point Payment Service, Real Estate P2P Service, and Wallet Service are all in the process of launching businesses within the year. ▲ Hdac is a hybrid blockchain platform that integrates public and private blockchains. Hdac is a hybrid blockchain platform that integrates public and private blockchain and is designed as an enterprise architecture that combines blockchain and IoT to reflect the needs of various industries. Hdac blockchain core framework includes elements such as consensus algorithm, blockchain, cryptocurrency, P2P transaction, security, VM, and smart contract. Based on this, the functions for B2C business service including Wallet, Explorer, node, mining, ePOW in the mainnet, which is a public blockchain service area. In a private blockchain area, the functions for B2B business such as access and management of channels, DevOps environment for development and operation at the same time, off-chain environment linking the existing legacy data or heterogeneous systems, user membership function with access to blockchain, and operational governance function. 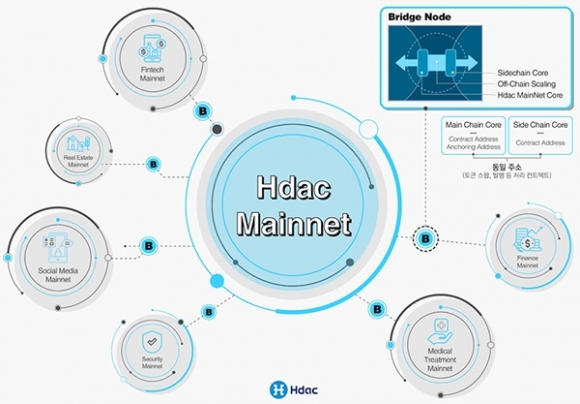 Hdac Technology also announced that the Bridge Node, which can compose a separate side chain for the enhancement of DApp ecosystem, will be released by the end of March after finishing its development, inner integrated testing, and verification work. Bridge Node provides off-chain scaling by connecting the mainnet’s core and the side chain core of DApp partner’s mainnet and adding a layer that deals with the contract. It also includes a private key that identifies the individual, allowing the owner of the contract, which occurs on Hdac blockchain, to be clearly seen on the mainnet. This enables audit trail of contracts to ensure reliability and scalability. With the application of Bridge Node, Hdac mainnet will be able to provide three services: Token Service, Contract Service, and Scalability. Token Service can issue tokens through Bridge Node or interchange with Hdac, and record the result of the operation through the contract to Hdac mainnet while maintaining the consensus algorithm defined in each blockchain. Contract Service enables issuance and management of new tokens and provides contract functions as well as Scalability that can design various multi-chains based on Hdac mainnet into an independent governance and chain economy by using bridge node. ▲ The private blockchain sector is also negotiating a partnership for BaaS business. Hdac Technology stated that it started the R&D of a new protocol ‘HPOS (tentative name)’ to upgrade existing ePoW, Hdac’s consensus algorithm, to PoS(Proof of Stake)-based consensus algorithm for effective network operation of Hdac mainnet. PoS is a category of consensus algorithm of public blockchain based on the economic stake of the inspectors in the network. 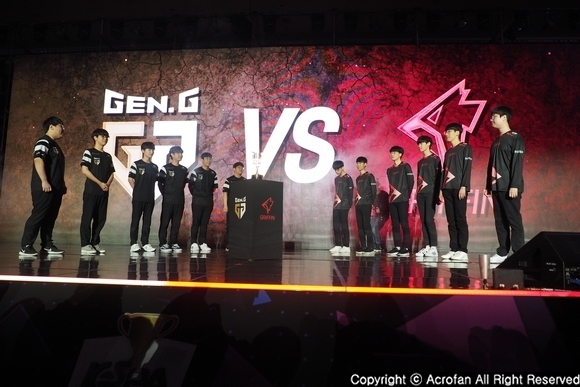 It has an advantage of improving energy efficiency compared to a consensus algorithm with mining method, which is a consumptive competition method. In addition, because a certain punishment is possible for actions against the utility and accuracy of the network and disturbances of networks, it becomes possible to freely design about network attacks and to maintain the economically safe-network security. In order to develop this new protocol, the development team of Hdac Technology is communicating globally through the meeting with Joseph Lubin, the Co-Founder of Ethereum, as well as development team of Ethereum POS protocol. 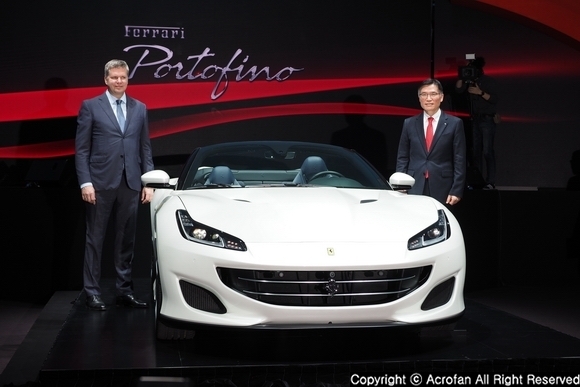 The team will pursue a comprehensive partnership such as joint R&D and business collaboration. 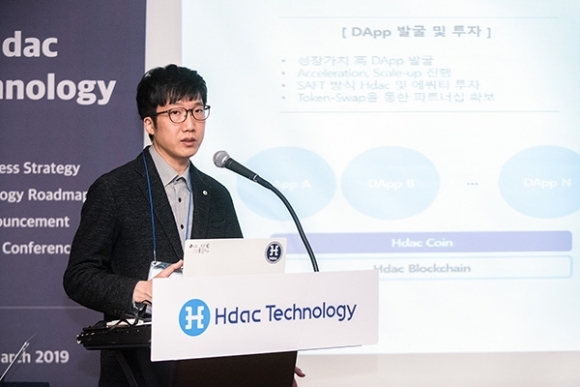 Hdac also initiated research into issuance technology of security token according to the token specification based on the ERC-1404 standard, and announced that it is studying smart contract on token issuance, transaction, and white labeling processing under legal restrictions . 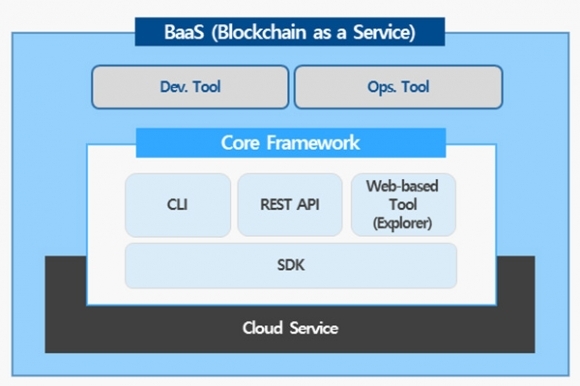 “We will provide a Blockchain-as-a-Service (BaaS) solution that can easily and conveniently build and operate infrastructure and services based on blockchain, even if it is not a blockchain specialist. What’s more, we are looking into cooperation with global cloud providers to provide the best enterprise blockchain for enterprise customers and to secure global market competitiveness” said, Moon-Ok Cho, CTO of Hdac.